EYEGLASSES AT AUSCHWITZ: One of 88 photographs by Michael Kenna on display in the Wachovia Gallery at the James A. Michener Museum, 138 S. Pine St., in Doylestown, Pa. through April 10. A fee of $4 will be required in addition to the regular admission charge of $6.50 ($6 seniors, $4 students). Gallery hours: Tues.-Fri. 10 a.m.-4:30 p.m., Sat. 10 a.m.-5 p.m., Sun. noon-5 p.m. For information on films and talks related to the exhibition, call (215) 340-9800, or visit: www.michenerartmuseum.org. In Middlemarch, George Eliot writes that "if we had a keen vision of all that is ordinary in human life, it would be like hearing the grass grow or the squirrel's heart beat, and we should die of that roar which is the other side of silence." The Holocaust is the roar on the other side of the silence pictured in the exhibit of Michael Kenna's stark black and white photographs, "Impossible to Forget: The Nazi Camps Fifty Years After," on display at the Michener museum's Wachovia Gallery through April 10. These are images of what was left behind when Kenna was photographing the remains of camps in Germany, Austria, Poland, the Czech Republic, Belgium, France, and Italy during the last decade of the previous century. When language runs into the wall of a subject this daunting you get phrases like those used in the museum's press release: "powerful and moving," "inexpressible suffering," "haunting emptiness," "expressive landscapes." The trouble with clichéd language is that the more often you see a subject treated in those terms, the more likely you are to take it for granted. Attempt to express the inexpressible too often and it numbs perception. Kenna does not need to attach overwrought descriptive titles to his images. The names of the camps are enough. Birkenau, Dachau, Buchenwald, Auschwitz, Treblinka, among others. The only photos he suggests readings for are Quarry Steps (Death Staircase) and SS Guard House (Death Gate). What these photographs are saying is "Look, reflect, comprehend as best you can, it's up to you: use your imagination." What we see forces us to acknowledge the reality of our own complacency and our instinct for denial, like a mechanism that clicks on as soon as we get too near to comprehending the mere echo of the roar on the other side of these images. This vision of what was left behind also makes us aware of aspects of ordinary, everyday life we take for granted: the shoes we wear, the lenses we see through, the suitcases we pack for trips we have the freedom to take rather than one-way journeys forced upon us. The "expressive landscapes" mentioned in the press release are not confined to images of brooding skies and abandoned railroad tracks. There are jumbled multitudes of personal effects that achieve the scope of landscapes. Like the photograph showing masses of pillaged suitcases chalked with the names of the owners, names you may recognize, names like Paul and Irene, or the last name of your best friend, which also happens to be the last name of a family living across the street from you. Here's a landscape of shoes, masses of footwear from the victims at Lublin-Majdanek. 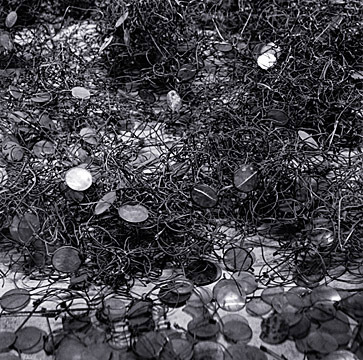 Here's a tangled, prodigous chaos of eyeglasses taken from the victims at Auschwitz. The pictures of these personal effects, at once still-lifes and landscapes, make you wary of using the terminology of art even as you use it. In the same way, you become uneasily aware of the ironic resonance the word "camp" takes on in this week's issue, with its special supplement on summer camps for children. But the inadvertent association of an abomination with so complacently accepted a seasonal routine is one of the undeniable connections images like this force us to comprehend. The reality of the violated "ordinary lives" on the other side of these masses of personal effects is mass murder. Why else preserve all this evidence? To speak of the "inexpressible" is too easy. Respond too expressively and you seem to be exploiting the Holocaust. But it's hard not to say more, hard to resist searching for potent analogies, if only as a way of confronting the extent of the atrocity through a sort of creative denial. Those complex visions of shoes and eyeglasses and suitcases reminded me of the aerial photographs of Princeton professor of visual arts Emmet Gowin's "Changing the Earth," a photography exhibit at the Michener reviewed in these pages last spring. Gowin offers another sort of perspective, one that suggests a different form of creative denial by leaving the evidence of human evil far below. Auschwitz in a Gowin photograph would be an insignificant blotch on the landscape, one element in a diagram, one part of a pattern, devoid of any significance beyond its formal position in the pattern. This exhibit challenges the ordinary museumgoing experience, with its stereotypes of response and the decorum governing the way one moves from work to work as an observer. You can't call it a "show" as you ordinarily would. Art exhibits offer more sophisticated forms of escape than do movies or thrillers or romances. But what are we escaping from? That word again: so-called ordinary life. This is anything but an escape, however. No one is likely to speak of "beauty" here or to expatiate learnedly on the photographer's technique. People are not shocked so much as sobered. Strangers seem more likely to speak to one another, and it won't be small talk. There is a communal sense of awe. An older gentleman you might not have paid much attention to in any other context attracts your interest here because he has the look of a survivor, or perhaps he's the relative of someone who did not survive, someone whose personal effects might be in one of those heaps of shoes, suitcases, and eyeglasses. Here's one example of the way an exhibit like this generates its own atmosphere of significance. While I was staring at the photograph of suitcases, I heard a child crying and looked toward the sound. In the middle of the room was an empty stroller. I never actually saw the infant. What more ordinary object than a stroller, empty or otherwise? But in that room, an empty stroller and the sound of the unseen child crying became part of the exhibit. In its own way, the abandoned object suggested the same "haunting emptiness" the press release attributed to the photographs. Use your imagination and an empty stroller could be in one of the pictures on the wall. There was no room for such luxuries as baby carriages on the trains to the camps. But if strollers had been a fact of ordinary life then, as now, when the victims were first routed from their homes and marched down the streets of Krakow or Warsaw, you'd have had parents pushing infants in strollers. It's also not impossible that this particular crying infant was responding to the aura of gloom filling the gallery, as if the pulse of evil was still alive in there, and just a hint of the roar on the other side of silence.